From Brexit, to Donald Trump, to extremist parties in Europe and the developing world, populism has dominated recent headlines. But what explains the rise of leaders who stoke nationalist anger in their countries, from Le Pen to Erdogan? How long will the populist wave last? Who will be the winners and losers in this climate, and how can we defend the values of democracy, free trade and international cooperation? No one is better suited to explore these questions than Ian Bremmer, the CEO of the Eurasia Group and acclaimed Time magazine columnist. Analysing the social, economic and technological forces fuelling this new wave of populism, Bremmer explains why we're witnessing a rejection of the democratic, global, cosmopolitan trends of the late 20th century. Us vs. Them is a definitive guide to navigating the shifting political landscape, for businesses looking to weather and survive the populist storm. Start reading Us vs. 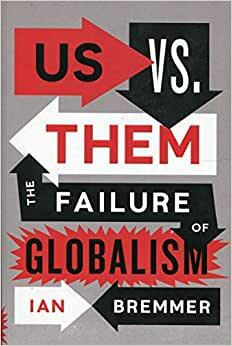 Them: The Failure of Globalism on your Kindle in under a minute. An exploration of the rise of global populism from the CEO of Eurasia group. The “we/they” division is global in scale and catastrophic in scope. It is already testing our civility, our security, our cultural identity, and our commitment to the ideals of democracy. But you already know that. This is the latest in a growing list of books that seeks to understand why the we/they divide exists without, to its credit, falling into the trap of using the data to simply fan the fires of partisan division. Bremmer has a political agenda (we all do), and he’s no fan of Trump, the person. He does, however, go out of his way to note, “Donald Trump didn’t create us vs. them. Us vs. them created Donald Trump, and those who dismiss his supporters are damaging the United States.” Whether you agree with that or not, he is one of a handful of analysts willing to try and rise above the personal vilification that defines so much of our current political debate. The author reviews the “we/they” division around the world and his analysis of current events in places like Nigeria and Venezuela is revealing and informative. I must admit, however, that for a time I found the analysis to be just a bit repetitive and a little superficial. There are lots of facts and figures but not a lot of insight into the why behind the what. I do believe, however, that Bremmer essentially closes the “why” loop in the last section of the book when he takes up the obvious question of a way forward. In short he believes that we must do no less than redefine the social contract between the government and the governed. And it is here that he once again opens his thinking in a way that few other authors have. All too often any discussion about the social contract devolves into a largely PC debate about freedom of the press, representative democracy, and the legal protection of marginalized people. We talk about authoritarianism and fascism, but what most citizens want, in the end, is a government that is fair, trustworthy, and competent, treats them with respect, and, most importantly, has their collective interests at heart. And that, Bremmer points out, is a social contract we can find common ground on. We are never going to agree on every aspect of what a good government should or should not do. If we can agree on the framework of a social contract that acknowledges the inequities created by globalism, the challenges presented by the mass migration of people, the need for lifelong education in a technologically advancing world (without ignoring the continued importance of the traditional liberal arts), and the global desire for personal security, we can make a start. My only disappointment with the book is that he doesn’t really take on the issue of the growing power of the corpocracy. No segment of society has benefited more from the asymmetry of globalism than the corporate and financial elite. Adjusting the social contract without, at the same time, revisiting the economic contract between workers, employers, and communities, will amount to nothing. Bremmer does, however, introduce the universal wage, which is not a new idea and will ultimately have to precede any chance of addressing the we/they divide. Globalism and technology have essentially commercialized every aspect of what it means to live in the modern world. We have to take the mere fight for survival (and the security of health care) off the table if we are to have any hope of restoring economic progress and human dignity. If, however, we can all approach the issues with the even-handedness and objectivity that Ian Bremmer does here, we can surely accelerate the process. I was astounded by the intellectual honesty of this book. Ian Bremmer is a credible globalist who worked his way up in life to the pinnacle of success as a Ph.D. and business owner, after having been born to a single mom in a working-class suburb of Boston. He has “street cred” as a man who has one foot in America’s working class, and one foot in its meritocracy “elitist” class. He’s very obviously never forgotten where he’s come from, or where’s he’s going. He comes across as an open-minded economist who seeks to make a case for preserving globalism by honestly weighing its benefits vs. its costs. He does not deny that many big business executives and politicians have underestimated the costs of globalization. Nor does he deny that many people are justifiably angry about their misrepresentations. He nevertheless believes that globalism represents the best path forward for humanity and seeks to show that its benefits outweigh its costs. Whether you’re a Populist or a Globalist, you can be sure that your views will receive a fair hearing. Globalization creates new economic efficiency by moving production and supply chains to parts of the world where resources— raw materials and workers— are cheapest…. In the developed world, this process bolsters the purchasing power of everyday consumers by putting affordable products on store shelves, but it also disrupts lives by killing livelihoods as corporations gain access to workers in poorer countries who will work for lower wages. So, which is it? Are all these millions of jobs being lost because of automation not related to trade, or are they being lost because companies are firing their higher-paid American and European moving the work to the cheapest labor countries? In my view, it is that companies are moving the work to cheap-labor countries to AVOID having to invest in technologies to keep their American and European workers productive. It’s cheaper to replace 1,000 Americans earning $25 / hour with 1,000 Mexicans and Chinese earning $2 / hour than it is to invest $20,000,000 in making the American workers earning $25 / hour more productive. Furthermore, it is difficult to produce a product in the USA where the average wage is $25 / hour and sell it in Mexico or China, where the average wage is $2 / hour. Those $2 / hour Mexicans and Chinese don’t earn enough money to afford the product. So what’s an American company going to do? They’re going to fire their American employees, move the work to Mexico and China, and produce it with $2 / hour labor. They’re going to sell part of the production locally, and then import the rest into the USA. They are going to inflate their profit margins on the USA sales by arbitraging the $2 / hour labor cost in Mexico and China with an American price list. But don’t Americans benefit by getting products cheaper? Not necessarily. Dr. Bremmer points out that Americans would rather have jobs that allow them to afford SOME products, even if they are relatively expensive, than to be unemployed and unable to afford any products, even if they are relative cheap. Nor, is there really any indication that foreign-made products are cheaper. We’ve been told that “If Iphones were made in the USA they’d cost $700 and no American would buy them.” Iphones ARE made in China, and they DO cost $700, and Americans still buy them. The winner is Apple, which pockets the difference between cheap Chinese labor costs and Americans’ ability to pay $700 for an Iphone. I am happy with Apple products and own the stock, so I am not picking on Apple. Just saying that there is no reason why it can’t make Iphones in the USA, and put Americans to work instead of Chinese. But why do we need copious immigration if it is true that technology is destroying so many existing jobs? Why bring more people into the country to fill jobs that don’t exist? My view is that our borders are intentionally left open to illegal immigration because: A) Big business wants them here to beat down wages, and B) Liberals want them in here to dilute the legacy, conservative-voting population and create more Liberal voters. And, let me say that I am a business owner who is married into an all-immigrant Hispanic family. My wife, a naturalized U.S. citizen voted for Mitt Romney in 2012 and Trump in 2016. I voted for Obama in 2012 and Trump in 2016. Dr. Bremmer describes the motivations of white folks like me, with industrial traditions in the Midwest, who switched from Obama to Trump. Dr. Bremmer leaves many questions unanswered. His view is that unrestricted free trade with all countries is good, because….free trade with all countries is good; open borders to allow copious legal / illegal immigration into a country is good, because….copious immigration is good.” These are tautologies, of course, that are taken as matters of faith, and not necessarily of evidence. My conception of Globalism is that it is an organization of big business / big government crony capitalists, supported by liberals in the media and academia, who seek to supplant national democracies with unelected supra-national bureaucracies unaccountable to the people of any nation. The objectives of big business crony capitalists are to replace the high-wage labor in the developed countries with cheap foreign workers. The objectives of Liberal politicians are to replace the legacy populations of each developed countries with Third World people who are prone to being manipulated to socialist agendas. If that’s your view, you will enjoy this book. If your view aligns with Dr. Bremmer’s that globalism must be maintained with all its warts, you will enjoy his view. My opinion about globalization has not changed after reading the book, but I am in the process of considering Dr. Bremmer’s points. My thinking may be matured as I reflect on his views, or perhaps it will not be changed. But I WILL reflect on Dr. Bremmer’s views, as I reread portions of the book. Among those who have been aware of how fast former perceptions have fallen away since the turn of the century Bremmer will be enjoyed for his multinational studies, for those conditioned by the carping ignoramuses in the media ‘Us vs. Them’ will only be a puzzlement that may start to open new channels. The book could richly change what the media rattles on about if read and understood by the pundits searching for answers. For those who follow the generated discontents in many lands and locations, Bremmer list out what is being offered as remedies without pushing any particular agenda. The future is a vast unknown but some are paying attention. If curious do read it, he knows his subject. * China, India, Indonesia, Russia, Turkey, Brazil, Mexico, Venezuela, Nigeria, Saudi Arabia, Egypt, and South Africa.